Prior to starting his own business, Anthony Light found himself unsatisfied with his traditional job, where money was the ultimate incentive in performing well. Upon realizing that bonuses and commissions were hindering his creativity, Light decided to seek career fulfillment elsewhere. He was completely liberated with the launch of Alightmouse Limited, a solo venture that has allowed for self-directed work hours, and a more flexible, healthier lifestyle. Through self-employment, Light has also been able to create open source projects. These unique assignments are things people can build for themselves, while promoting sustainable living. 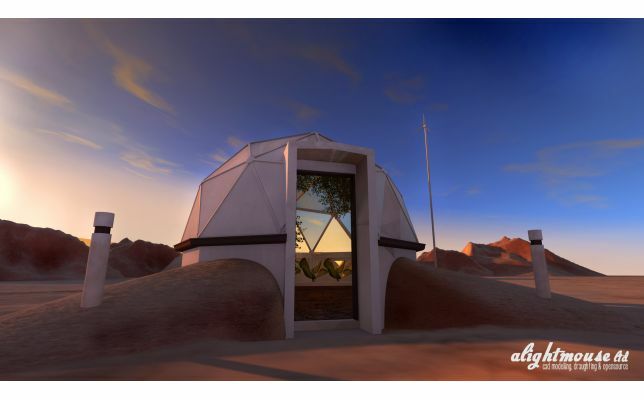 His first major open source project is a greenhouse geodome, inspired by the works of the late American architect, Buckminster Fuller. A Greenhouse Fulla Buckminster is now digitally available, and Light is excited to have others contribute with revisions and provide feedback. "It was only after the 7.2 and 6.3 earthquakes here in Christchurch in 2010 & 2011, that I got a glimpse of how vulnerable the community really was; all services, shops, petrol stations, and grocery stores were suddenly closed, or in some cases, destroyed. Petrol stations for up to 100km out of town were running dry because people went into a panic mode, and the drop in supply made things so much worse. Not to mention, food prices significantly went up; 1.5L bottles of water at the local dairy suddenly cost nearly $8.00 a bottle. That, and all power and water, were shut off to the local area. Although everything came back to normal within a week or two on my side of town, those not so lucky had no power, water, or services for over a few months. It was then that I realized how much of difference it would make if everyone grew 90% of their own food at home." Light's project has the greenhouse 9.5 sq/m in size, incorporating a timber strut construction with timber nodes, plywood cladding, and 8mm twin wall polycarbonate glazing. In order to avoid expensive building consent applications, the floor area is only 9.5 sq/m. Additionally, Lights work includes full construction drawings with information regarding cladding types, thermal mass, insulation & ventilation. He will soon to be releasing possible aquaponics, hydroponics & standard planter box fit out options, with downloadable 3D models of the dome (for CAD users), plus videos for anyone wanted more information and clarity on how the dome goes together. On May 4, 2014, A Greenhouse Fulla Buckminster was released on Light's website, "This project has been a year and a half in the making, even before I left my last job. I'm so happy to see that I can A) still earn a living and B) participate in cool projects, for free, that I can share all over the world." "It'll definitely be a challenge, but from what I've studied about aquaponics and it's possible uses, I see it giving people the potential to grow both fish and plants from home. All of which have a high nutrient density and a low carbon footprint, while using organic growing techniques and 99% percent less water than conventional growing methods. This project is something that I have a great passion for, and with the help of the Internet, I look forward to seeing how this project grows and develops." This blog post is related to the following tags anthonly light, Architectural Draughting, Architecture, BIM, CAD modelling, CAD rendering, geodome, going green, green, greenhouse, open source, Residential Architectural Design.